The WHDPC and the Town of West Hartford invite you to join us for the next Pop-Up Dog Park, this Saturday, November 18, from 10:00 am to 1:00 pm. For the first time we will have a separate session for small dogs who might feel overwhelmed in the open session. The small dog session will be from 10:00 to 10:30. Starting at 10:30, it will be open for all dogs. It will be held in the field at the end of Southwood Drive, off South Street, in the southeast corner of town. Southwood Drive is a residential street, and the closest houses are quite close. 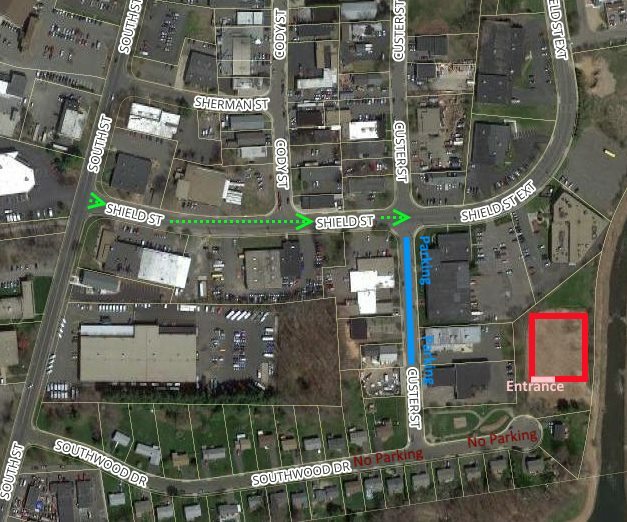 To minimize the impact on the neighborhood, please approach by turning down Shield St., and parking along Custer. Then walk your dog, on leash, to Southwood, and enter at the end of the street. Southwood is located in the southeast corner of town, near the Shield Street post office. From Elmwood, head east on New Britain Ave, past New Park Ave, and turn right onto South Street. Go left on Shield Street, and park on Custer or Shield. Link to the corner of South St and Shield St in Google Maps. Then follow the directions to parking and the pop up. ← Our next event is the Pooch Plunge!